Only today, Monday, August 17th, Bushwick Beach Bus is taking Bushwick and Williamsburg residents to New Jersey water park, Action Park. Known for taking us to the beach, Bushwick Beach Bus will be making stops at Pearl’s Social Club, Union Pool, Union Square, and Hoboken, NJ starting at 10 am. The Vernon, New Jersey water park is known for bending the rules of ride construction to a criminal level. Earning the nicknames “Traction Park” or, my personal favorite, “Class Action Park” came easy for a place that had a water slide with a vertical loop for thirty days before being shut down after enough kids were knocked around. After 1996, the park switched owners, had a name change, and a year ago this summer was re-bought and refurbished by the owner’s son. Andy Mulvihill replaced the sign advertising the 35 acre park on April Fool’s Day 2014 to Action Park’s original 1978 one, causing passersbys to think of it as a masterful prank, there to pay homage to a former visionary's sense of humor. Hint: IT SO WASN’T. 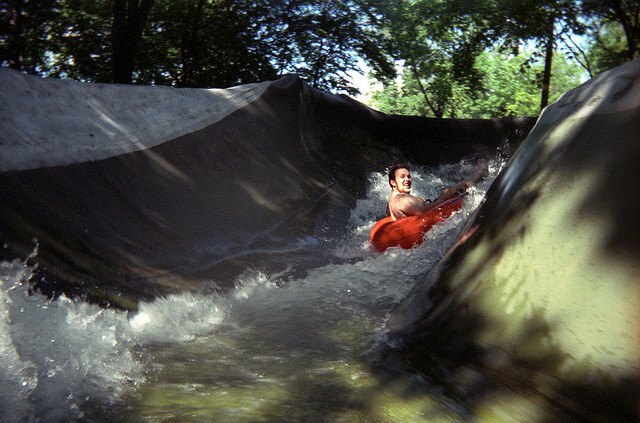 At Action Park, you have the possibility of standing one-hundred feet in the air and the next moment having a trapdoor beneath your feet drop you down a one-hundred foot slide. You talk about lazy rivers at every other water park: how you just lay there and it’s so relaxing and blah blah blah, but the Colorado River Rapids offers a more exciting, action-packed twist, allowing us “adults” to re-establish a positive relationship with fear, because Action Park doesn’t have time for that. And, since helmets are included in the Colorado River Rapids, you can pretend that you’re doing a simulator for the actual river rapids out west. 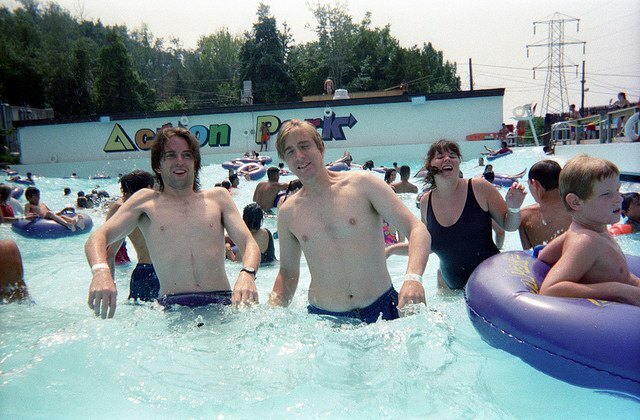 If you've cast doubts based on Action Park’s past, knowing that Vernon had to purchase additional ambulances in 1987 to service the needs of its thrillingly dangerous water park, Andy went on the record to the New York Post stating "I refuse to be involved in any rides where anybody can get hurt." During his youth, Andy’s dad would have him test Action Park rides draped in hockey pads. Unlike the old park, new Action Park is bringing lifeguards who will blow the whistle at you, and safety signage for good measure. Also because in 2015 you can't really get away with not having lifeguards and safety signs. Calling all daredevils/summer sweethearts/lovers of water/people who have Monday off OR feel like gambling with your sick days---> DEFINITELY hop on Bushwick Beach Bus on Monday to cap off your summer! We're not trying to encourage you to skip work, just letting you know that it's totally on that table...we've already talked to your boss and signed your permission slip. So, yeah, you're welcome. Be at Pearl’s Social Club by 10 am on the 17th for pick up. For our friends over in Williamsburg reading this, the bus will be in front of Union Pool at 10:15 am. Forget about work for once in your life - you’re lying if you tell me that you haven’t been itching to do something totally wacky all summer. Why not at at Action Park?